Once you have progressed far enough in your shotmaking technique to feel it may be time to move from the range to the golf course, many people feel intimidated because there are so many things to know. Who to play with? What course to play? Am I paying too much? Will I look foolish? The list goes on and on. If you allow the things you don’t know to prevent you from playing, you will be costing yourself a great deal of the joy and satisfaction golf can bring. The problem with many other san diego golf lessons is that they tend to focus only on the actual golf swing mechanics but neglect to teach the student about their entire behavior and etiquette expected on the golf course. Let a more experienced player take you under their wing and play a few rounds with you. You will quickly learn there is nothing to fear and a huge percentage of your fellow golfers are both friendly and encouraging. Golf etiquette, in general, has to do with learning the fine points of how to act while you are on the course in a way that will never affect your playing partners adversely. Knowing, for example, that the person farthest from the hole should play first or that you should not walk ahead of someone about to play because you might get hit by their shot are obvious concepts that take little time to acquire. I provide full circle knowledge of the game and most of the san diego golf lessons you will find do not cross the t’s and dot the i’s. It is significantly more important to know course etiquette and how to get around on a golf course than actually hitting the golf ball, especially in the business environment. Conversely, what I will discuss here are slightly finer points that may not be quite as obvious. I truly believe that by simply observing well, nearly everyone would garner the information I am about to provide, but to prevent that process from having any “bumps in the road”, here are a few things I’m sure you would like to know. Within this topic, I will discuss three areas of interest: courtesy, pace of play, and interference. As I mentioned previously, most of the courtesy issues on the golf course are common sense based, and can be summarized by treating others the way you would like to be treated. As an illustration, however, I will give you three situations in which the correct action may not be as readily apparent. First, you are playing a long par five on an unfamiliar course. Your second shot cannot possibly reach the green and you hit when the group in front seems out of range. Your ball takes a series of unexpected bounces off the hard ground and ends up at the feet of the group ahead just as they are about to play their shots to the green. One of the players in that group turns around and raises his hands to indicate his displeasure. Actually, this is a fairly common situation. It is easy to defuse the tension on a golf course if handled properly, but if it continues happening, it will usually escalate into a shouting match or worse. It can be avoided by asking someone more familiar with the course if it is okay to hit or by simply waiting until there is no possibility of coming close to the group ahead. Once it has happened, however, your job is to make contact with the group as soon as possible to apologize. Saying something like, “I’m really sorry, I didn’t know it would bounce that far,” should do the job. If you are on the other side of the situation, responding by saying “Oh, no problem, you must’ve really hit that one well!” is similarly appropriate. I have, unfortunately, seen the group ahead either step on the ball or hit it back at the original offender. Definitely not okay. In the second situation, your group arrives at the green only to find a wedge on the edge of the green next to the bunker. There are actually four options, two of which are bad and two of which are good. Keeping the club for yourself is the worst option, and is wrong on many levels. Besides its blatant immorality, would you ever get up-and-down with that wedge due to your severely damaged Karma? Doubtful. Second, leaving it there is also a poor option. This allows for the possibility that a person in a group behind you will keep the wedge for themselves. You must protect the original owner from that outcome. Third, turn the wedge into the golf shop. Safe and sane, nearly guarantees it will make its way back home. Finally, the best option is to pick it up and ask the groups ahead as you see them on the course if anyone left a club behind. Ask them what kind of club it was before you hand it over. They will be immensely grateful and will be able to use it for the remainder of the round. Even more common that they will come back and ask your group if you found a club within the first half hour of it being lost. The last situation is a long-standing tradition in the game. You are on the 18th green and have already putted out. When another member of your group holes out, they turn and walk toward you with their hand extended. Besides shaking their hand, what else do you do? Two things: first, say something pleasant like, “Nice playing with you.” Second, and much more importantly, take your hat off! It is considered by most to be a sign of disrespect if you do not remove your hat. This does not apply to women, because they often use their hats to keep the hair out of their eyes, and obviously, if you are not wearing a hat. There is a lot of emphasis in golf these days on playing quickly. I think this sentiment comes from the fact that the time commitment to play a full round is daunting for some people. In my own case, I can think of nothing I would enjoy more than spending five hours on a nice day playing a good course with friends. I am in no hurry to get home to clean the garage. However, certain courses and certain individuals are ardent in their desire to move you along. The easy way to understand this concept is to think of a golf course filled with foursomes as a length of pipe filled completely with 36 tennis balls. If you push a new ball into one end, another one will pop out of the other end. You can not play any faster then the group ahead of you and the group behind you can not play any faster than you. The only time problems arise is when a gap develops between groups for some reason. If the problem is temporary, like a very difficult hole or several balls being lost, the time can be made up quickly and the gap eliminated. However, if the gap remains, particularly if it is in front of your group, every person on the course behind you will view you as the villainous culprit. The obvious solution to this dilemma is to keep up with the group ahead. If you have a slow player in your group, simply make him cognizant of the fact the group ahead is pulling away. As long as you do your part, you are okay. If you are behind a group you feel is playing too slowly, do not take things into your own hands. Call the golf shop, tell them what is happening, and they will usually send someone out to speed up the offenders. For most golfers, this is the most serious breach of golf etiquette. When I say interference, what I am talking about is something a person can do while you are over a shot that will disturb or disrupt you severely enough to change the outcome adversely. The higher the stakes and the better the players involved, the more severe an offense of this kind becomes. On the PGA Tour, for example, where one stroke could mean $1 million or the difference between winning and losing a major championship, such things are unthinkable. As a result, if I were to use an adjective to describe the etiquette on tour, it would be “impeccable.” You might say, “This is not the Tour, no one in my group breaks 90,” and your point is well taken. Only you can accurately assess the level of intensity in your foursome. Still, no one wants to be “blown off a shot.” Here are the three kinds of interference that should be avoided. When someone is standing over the ball preparing to hit any shot, don’t move! You should stand facing their chest or back. You should not stand behind them looking towards the target (down the line) where they can look back and see you or in what is called their “through line” around the green so when they look up at the hole they see you behind the pin. On the green, the exception to this rule is that AFTER a putt is hit, you may circle in behind the player to see how the ball will break. When you tend the flagstick for someone, you should hold the flag so it is not moving around when they look up at you. Next, it is important to understand there should be only one ball on the green when a person is putting. Many people feel it is a time-saving measure to mark their ball earlier, but it is simply not done by anyone who is a serious player and is considered to be a breach of etiquette. When you watch competitive golf on television, please notice that on the PGA Tour, you will never see another ball on the green when someone is putting. If someone who is 15 feet from the hole asks you to mark your ball that is 10 feet from the hole before he putts, he is not being rude. You were rude not to have marked it already. Finally, watch your shadow. Especially important on the green early or late in the day so that you do not allow your shadow to touch another player’s line of putt. There are a variety of sounds on the golf course that if heard at the wrong moment could ruin someone’s shot. We have all seen the reaction of a touring pro when a photographer clicks a camera during a swing. By far the most common you will see happens when a person who is unaware someone is hitting talks at the wrong time. It is your job to look around and be constantly aware so that you know when someone is over a shot. Jingling change in your pocket, spitting, the ripping sound of a Velcro glove; all bad. It may interest you to know that in many high-level amateur tournaments if a cell phone you own goes off, you would be disqualified on the spot. Even a phone on vibrate in the cup holder of a cart is loud enough to be disturbing. The final kind of interference does not affect the player as much as it affects the ball he has hit. In effect, everyone playing a golf course has some maintenance duties to keep the condition of the course pristine for those who are yet to play. You should not create problems, and if you do, you must repair them before you move on. The crater on the green left by a ball mark should be repaired with a divot tool or tee until the entirety of the crater is raised up to become a mound that is higher than the level of the green. 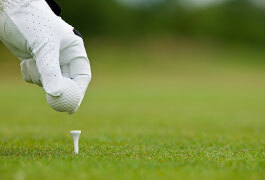 Then, using the bottom of your putter, not your shoe, tap it down several times until it is perfectly flat and smooth. Divots in the fairway should always be filled with a sand bottle. If you are walking and one is not available, you can replace a divot to temporarily prevent someone from getting a horrible lie, but keep in mind, the maintenance staff will take it out and fill it with sand later on. In a bunker, pull the rake toward you until the big footprints and impact crater are more level but then push and lift with the rake to remove the furrows created by the tines of the rake so that the sand is perfectly smooth. Finally, the worst thing you can happen to anyone on the golf course is to reach the first green and find some sunflower seed shells on the green near the hole. This means two things. First, your ball will be knocked off-line unless you clean them all up before you putt. Second, it is probably going to happen on every other green for the rest of the day! As a result, even though I am personally against capital punishment, it may be appropriate for Mr. Sunflower Seed somewhere in the groups ahead of me. Click Here to Buy a Playing Lesson Today.